On May 4th, BBC journalists and crew came to the Robotarium East at the University of Edinburgh to report on our NASA Valkyrie Project for a special BBC News feature that was live streamed on the BBC Facebook page at 6pm. The feature, presented by BBC Science video journalist Victoria Gill, was viewed by over 200,000 Facebook users and gathered over 2000 questions and comments. Some of these questions were posed to ECR Director Sethu Vijayakumar and the Valkyrie team during the filming. A final clip from the BBC's visit can be found on BBC News Scotland’s website. The Valkyrie was developed at NASA's Johnson Space Center in Houston, Texas, and the Edinburgh Centre for Robotics has one of the three protoypes that were made - the only one in Europe. 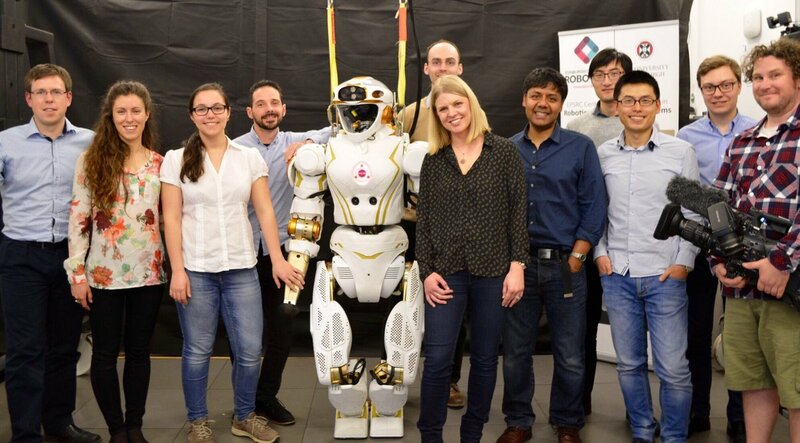 Since Valkyrie arrived at the University of Edinburgh’s Informatics Forum, the team of PhD students and Post Docs have been adapting their research to work with the robot. Our team’s development of Valkyrie will focus on data-driven dynamics learning and model-based control schemes – projects that will aid human-robot interaction here on earth as well as in space. The BBC spoke to those involved and informed viewers on the various aspects of our research and progress with Valkyrie. One viewer asked how Valkyrie senses the world around her, and Dr. Maurice Fallon explained that the Valkyrie has two stereo cameras which are the robot's 'eyes'. In the middle of the head is a laser, with which Valkyrie can build a 3D view her surroundings. Dr. Fallon specialises in Valkyrie’s real-time perception and dense mapping, whilst his colleague Dr. Zhibin Li contributes significant expertise in humanoid locomotion. Standing at 5ft 11in tall and weighing nearly 20st, Valkyrie's humanoid form has drawn a lot of media attention - but why did NASA design it that way and how is it important to the ECR's research aims? In terms of space missions, there would be no need for specialised ramps on the spacecraft to accommodate robot wheels. Plus, the human bipedal system has its advantages over wheels - small wheels can get stuck, whilst big wheels are less manoeuvrable. But developers and researchers also want the Valkyrie to function well in environments that were built for humans. Early the next morning, Professor Vijayakumar appeared on BBC Breakfast, spreading the word about the exciting times ahead for the Edinburgh Centre for Robotics. The interview featured some of our smaller pieces of kit – a miniature humanoid robot and the iLimb, a prototype prosthetic hand. Professor Vijayakumar gave a demonstration of the iLimb to BBC Breakfast presenters Charlie Stayt and Naga Munchetty, showcasing its capacity to grasp and release in shared autonomy mode. At least fifteen press articles were also published that day by national and local papers, including pieces from The Independent, The Times and The Scotsman. A number of online articles have also since been published, including on BBC News Science & Environment and BBC Newsround. Finally, the national BBC News at Six showed footage captured alongside the live-stream visit from the previous day, again presented by BBC Science reporter Victoria Gill. But there will be many technical challenges to come, such as furthering Valkyrie’s mobility, which is still fairly basic, and developing highly adaptable algorithms that will enable her to interact with people. Pursuing these aims will be important for Valkyrie’s functionality on earth, and the Edinburgh Centre for Robotics is also particularly interested in exploring the potential of applying Valkyries capabilities to a wider range of contexts such as health care and disaster scenarios.